The incinerator described was developed by the Innovative Technology Group at De Montfort University under the direction of Professor D. J. Picken. The text and photographs used in the preparation of this Technical Brief were provided by Andrew Russell, consultant in energy and appropriate technology and project engineer for this project. The medical waste incinerator is a simple two-chamber natural-draught incinerator designed to be operated at temperatures of 800°C and higher. The performance of the incinerator will vary depending on the moisture content of the medical waste but a throughput of up to 15kg/hour can be achieved. The incinerator has been designed so that it can be built on site, using standard building bricks or blocks and lined with refractory bricks. All the steel components, such as the loading door, the ash removal door and air inlet apertures can be made using basic workshop equipment. Wood, wood and dry waste soaked in kerosene or diesel is required initially to start the combustion process. Once the correct temperature is reached, the medical waste is loaded into the incinerator. Much of the medical waste will have value as a fuel and will contribute towards combustion but additional wood or kerosene may be required to ensure that adequate combustion temperatures are maintained. The initial combustion occurs in the primary chamber and then the hot gases pass into the secondary chamber where the combustion process is completed. The two-chamber design helps to ensure that the combustion time is sufficient to destroy the products of combustion and minimise any harmful emissions. The incinerator should be situated under a simple open-sided roofed structure, such as a lean-to, away from tall buildings and in an area free from air turbulence. Although it can be operated in the open, a roof will help to protect the incinerator from rain and provides shelter for the operator. The incinerator is capable of incinerating most types of medical waste including textiles, plastics and packaging. It can also incinerate most types of drugs, medicines, vaccines and sharps – as long as they are mixed with other wastes. However, as grease-based products, such as ointments, creams and Vaseline create large quantities of dense black smoke when burned, they are best disposed of by other means. The fuel value is the ability of any material to contribute to sustained combustion. A material with a high fuel value will contribute to the combustion process helping to maintain high temperatures. Materials with a low fuel value will result in poor combustion and may, depending on the amount of other high value fuel available in the incinerator, lower the combustion temperatures or even cause combustion to cease. Stack is another name for a chimney. Support fuel is the fuel used to start the incinerator and, when necessary, to provide additional combustible material to ensure effective incineration. 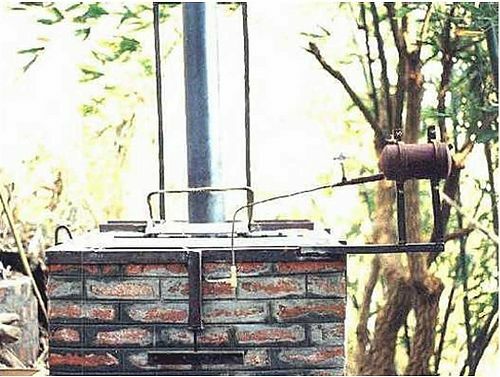 Refractory bricks (firebricks) are made from refractory clay which can withstand high temperatures. Depending on the manufacturer, they can be available in a range of sizes and grades. The following construction notes should be used in conjunction with the main drawing of the incinerator (see appendix 1). These notes are based on experience gained during the design and development of the prototype in the UK and the building and operating of incinerators at four hospitals in developing countries. 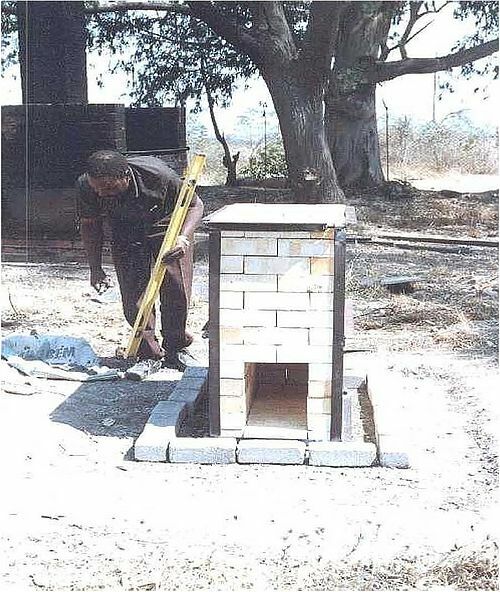 Two of these incinerators are located in Nepal (one using either wood or kerosene and the other kerosene only), one is in Zimbabwe (using wood) and one in South Africa (using diesel). 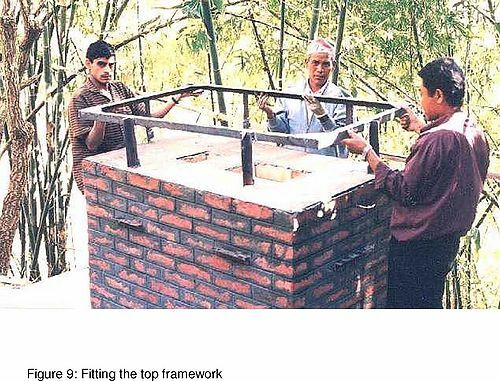 Although these notes describe proven techniques for the successful construction of the incinerator, it should not be assumed that this is the only way of building one. Minor modifications to material sizes, types or specification may be required to suit local conditions. With the exception of the refractory bricks, all the other materials specified in the materials list (see appendix 2) could be replaced with others of different sizes or specification to suit local availability. 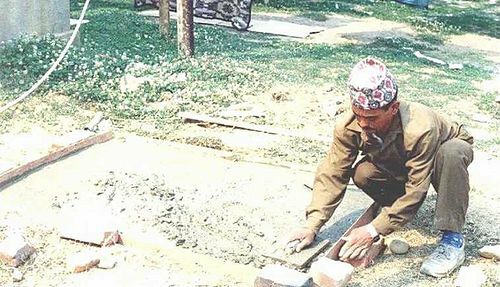 For instance, the common building bricks used for the outer wall could be replaced with cement bricks (as in Zimbabwe) or blocks, or where an angle iron of 50 x 50 x 3 is specified, 40 x 40 x 3 could be used instead. 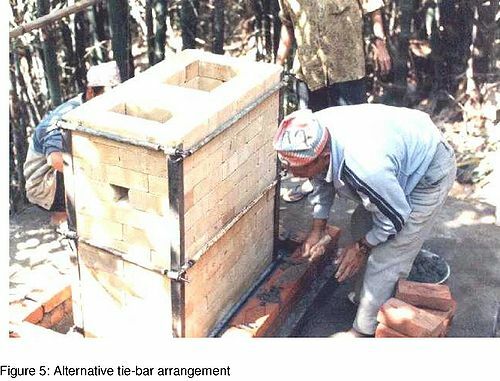 The actual size of the incinerator is dependent on the size of the bricks used and because the standard size of brick can be different from country to country – and even from region to region -slight differences in size of the incinerator may be expected. These variations should not effect the performance of the incinerator. 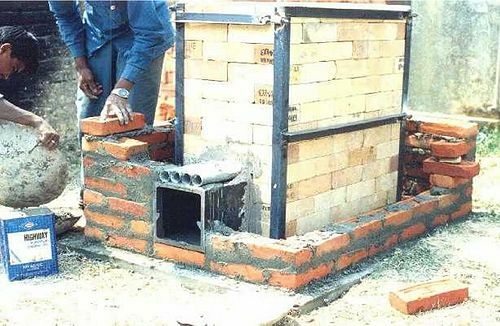 The incinerator is a simple construction using firebricks, standard building bricks and steel (angle, sheet and tubing). It consists of two chambers -the primary combustion chamber (load chamber) and the secondary chamber (flue). They are built from firebricks and are located within an outer wall constructed from standard building bricks. An air gap, approximately the width of one standard building brick, separates the chambers from the outer wall. A top plate, made from sheet steel, has openings in it for the loading door and stack (chimney) fittings. The stack is fitted over the top of the incinerator and clamped in position by an angle iron frame and angle iron strips fitted to the outer wall. The loading door, made from either channel-section or angle iron, fits within a door-frame welded to the top plate. It is hinged at the front so that the door opens towards the operator. The door frame is then filled with sand to form a seal. Also welded to the top plate are a number of lengths of angle iron that help to stiffen the top plate and form a box around the stack opening. 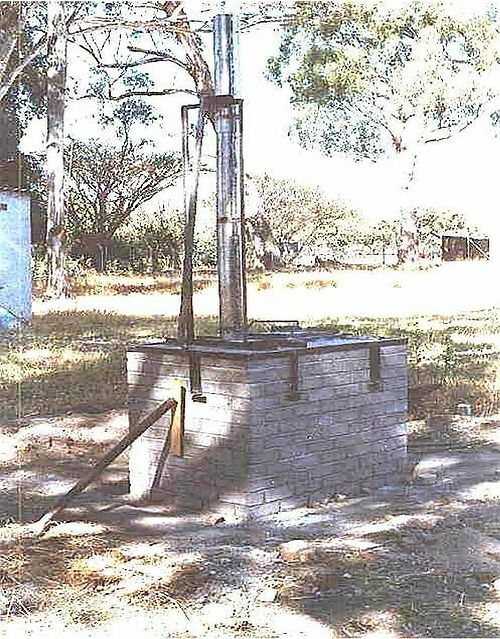 The stack, which is made from sheet steel, fits over a spigot-plate and is supported by a simple angle iron frame bolted to the top-plate clamping frame. Foundation The foundations should be slightly larger than the incinerator and a guide to the actual size can be gained from laying out a course of standard bricks -six long and four wide -to represent the outer wall of the incinerator. A gap should be left between each brick to allow for the thickness of the mortar. The length and width should be measured and then the foundations should be built one brick wider all round and 75mm deep. A standard concrete mix (3:2:1) of ballast, sand and cement should be used (see Figure 1). 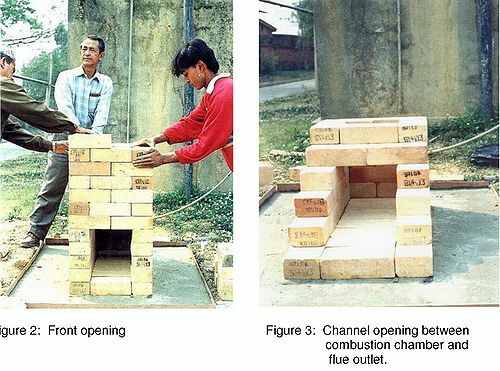 Combustion chamber (drawing item 2) The combustion chamber is constructed from firebricks, without any mortar, and is clamped together to provide strength and reduce the possibility of bricks being pushed out of alignment during incineration. A standard fire brick approximately 225 x 115 x 76mm (9 x 4.5 x 3 inches) and capable of withstanding temperatures of at least 1300°C should be used. The combustion chamber is four (4) bricks long by two (2) bricks wide and thirteen (13) courses high (see drawing). The first course forms the floor of the combustion chamber while the other twelve form the walls. 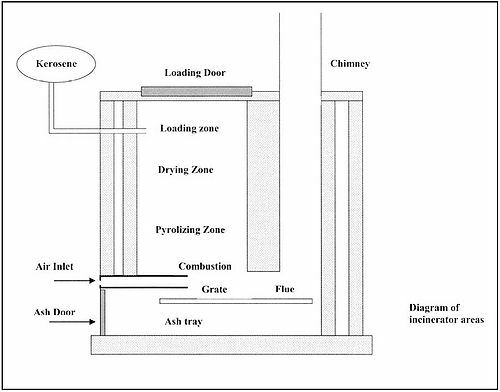 Particular care should be taken to ensure that the front opening (fig 2) and the channel between the combustion chamber and the flue outlet (fig 3) are built correctly (see design drawings). The ash door (drawing item 3) and air inlet tubes (drawing item 4) must fit in the front opening. These are sealed into position using fire cement (or fire clay) during the building of the outer wall. Clamp frame for combustion chamber (drawing item 22) The clamp frame consists of four angle iron uprights bolted together using a number of horizontal tie bars. The uprights should be slightly shorter than the outside height of the combustion chamber (i.e. 5 to 10mm). The tie bars can be made in a number of ways to suit locally available materials and workshop facilities. One method (shown in Figure 4) is to make tie bars from angle iron with one end welded horizontally to an upright and a short length of 12mm steel pipe welded to the other end. The opposite upright has short lengths of steel pipe welded to it in alignment with those welded to the tie bars. The clamp frame can then be fitted to the combustion chamber and tightened around the bricks using nuts and bolts through the water tubes. Another method (see Figure 5) is to weld short lengths of water tube horizontally to the uprights and join them together using tie bars made from water tube or round steel bar, with bolts welded at either end. The air inlet can be made from square, rectangular or round steel pipe. The air inlet cross-sectional area should be approximately 4800mm2. The inlet can be made from pipe or tube, or from a number of smaller tubes welded together (see Figure 6). 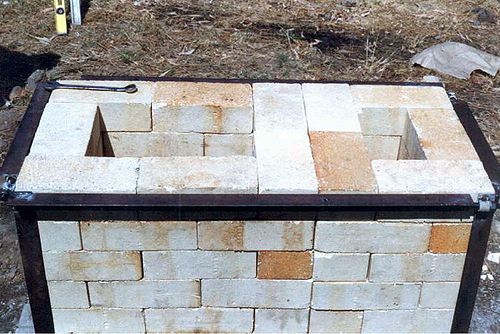 Outer wall (drawing item 5) Using standard bricks and mortar build up the outer wall until it is level with, or slightly higher (5mm maximum) than the top of the combustion chamber. The outer wall should be six bricks long and four wide, and between 12 or 13 courses high depending on the depth of the brick used and thickness of the mortar. It is important that there is an air gap between the combustion chamber wall and the outer wall. This gap provides insulation between the inner and outer walls, so ensuring that the outer wall never becomes too hot. It should be approximately the width of one standard brick all round (see Figure 7). Figure 7: Laying out the outer wall allowing for air gap should only protrude slightly into the combustion chamber. Top framework (drawing item 6) The top frame (see below) clamps the top plate in position. It is made from angle iron with sheet steel gusset plates (drawing item 7) welded across the corners to provide increased strength. Six vertical hangers are welded to the frame, two on each of the longer sides and one on each of the shorter sides. These hangers are bolted to an angle iron rail which is fixed to the side of the outer wall using screws and wall plugs (see Figure 8). The top plate is made from sheet steel and has the loading-door frame welded to it, along with a number of lengths of angle iron forming a frame for the stack spigot-plate. These also provide stiffening for the top plate. The top plate itself should be cut slightly smaller than the outer wall (approximately 10mm all around) with two cut-outs corresponding to, and slightly larger (again 10mm all around) than, the openings into the combustion chamber. The top plate should be bedded onto a thin layer of fire cement on the inner chamber and ordinary cement on the outer wall, sufficient cement being used to ensure good sealing all round. 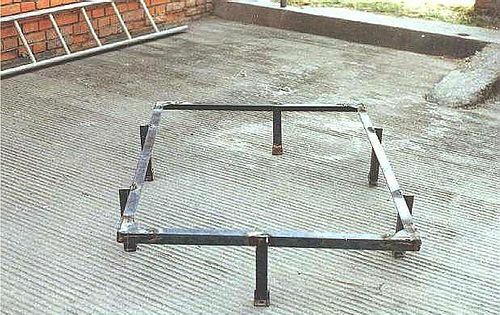 The plate should then be clamped in position using the top framework described above (see Figure 9). If possible, the loading door frame, flue exit frame and strengthening bars should be welded in place once the top plate is clamped in position to minimise any buckling that may occur during the welding process. However, the complete top plate can be fabricated elsewhere and clamped in position later although, in this case, it may not be possible to ensure that it is sitting perfectly flat on top of the inner and outer walls. The loading-door frame (drawing item 16) is made from channel section and should be fully welded to the top plate. The frame should be made larger than the opening in the top plate so that it can be fully welded on the inside and outside edges. The flue exit-frame is constructed from angle iron and fully welded to the top plate on the outside only. The stack spigot (drawing item 18) will fit inside the box and should be clamped in position using two lengths of angle iron bolted to the box. This enables the spigot plate to be removed and replaced as necessary. Loading door (drawing items 9 to 15) The loading door is made from channel-section frame (drawing item 15), such that its outside edges fit inside the loading door-frame. It is covered with a fully-welded sheet steel plate. Two angle-iron hinge support brackets (drawing item 11) are welded on top of the door. A baffle plate (drawing item 13) is suspended beneath the door so that it hangs into the combustion chamber by approximately 100mm when the door is closed. This baffle plate will help prevent the door and door handle becoming too hot during operation. The sheet steel cover should be welded in position on top of the door. 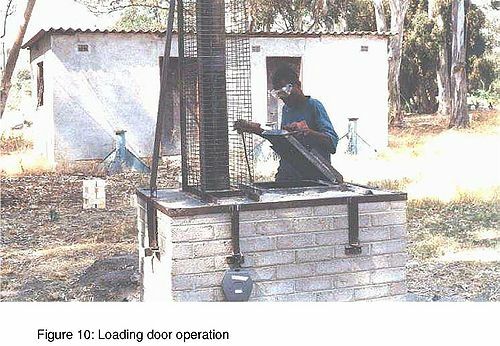 The door should be hinged at the front end of the incinerator so that it opens towards the operator (see Figure 10). This provides protection to the operator in case blow-back occurs when air enters the combustion chamber through the open loading door. The hinge is made from a short length of steel pipe welded to the underside of each of the support brackets and two more pieces welded to the loading door frame. A length of steel stack, it is useful to have a removable bottom section of about 1m long. The stack is positioned over the spigot, on the spigot plate and clamped into the stack box. A simple support frame is required to hold the stack in place. This can be constructed from angle iron as shown in Figure (see Figure 11). A rain cap should be fitted on top of the stack and a steel-mesh guard (approximately 1m high) placed around the stack to prevent people from touching it as it heats up. The flue-exit frame should then be filled with sand which provides an effective gas seal. Grate (drawing item 1) A simple grate can be made from angle iron or steel bar or a mixture of both. The grate should be long enough to extend across the whole of the combustion chamber and it should be easy to remove either through the ash door or the loading door. Kerosene tank and feed pipe (kerosene fired version only) A fuel tank with a capacity of between 2 and 5 litres should be fitted to the front of the incinerator as shown in Figure 12. A tank from a pressure kerosene stove is most suitable because it enables the kerosene to be added under pressure. If none is available, then the tank should be placed approximately 500mm above the top of the incinerator to provide a head of fuel. The feed pipe enters the incinerator combustion chamber at one brick course below the top and should be sealed in position using fire cement. The tank should be fitted with an on/off valve or tap to control the flow of kerosene. In addition, a simple push button valve with a spring return can also be added to give better control over the flow of fuel. The button valve will also ensure that kerosene does not flow freely into the incinerator if the main flow-control valve is left open by mistake. Please read the following safety notes carefully: When opening the loading door always wear eye protection and a face mask. Opening the loading door on either the wood or kerosene fired version during operation will mean that additional air will enter the combustion chamber. This may cause blow-back to occur and the flame to flare up out of the loading door. The blow-back does not last long but it could cause injury to anyone standing too close to the incinerator. Particular care should be taken when using kerosene as atomised vaporised fuel may be present at the top of the combustion chamber which could ignite vigorously. The operator should open the door while standing at the front of the incinerator. The loading door is designed so that it hinges from the front of the incinerator and opens towards the operator. This provides the operator with some protection from any blow-back and keeps him/her away from the opening to the combustion chamber. The operator should wait a few moments to allow any blow-back to die down before loading waste materials into the incinerator. • Some waste materials such as ampoules and glass bottles containing liquid vaccines and medicines may explode during incineration causing glass and other waste materials to be blown into the atmosphere. 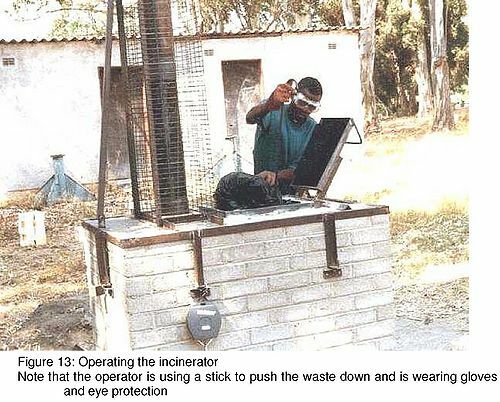 The operator should ensure that eye protection and a facemask is worn when opening the loading door or when visually checking the combustion process through the air inlet or when removing the ash door while the incinerator is in use. Always wear heavy-duty gloves and apron while handling medical waste. If the waste is bagged hold the bag by the top and away from your body. Drop the bag through the loading door opening and if it gets stuck use a stick to push the bag into the combustion chamber (see Figure 13). If the waste is loose, use a shovel to load it into the combustion chamber. Never handle the ash or other waste materials by hand. Use a stick or scraper to pull the solids out through the ash door and into a dustpan or box. Do not remove the ash or other waste materials from the combustion chamber until they have cooled down. This will take about five hours. If the incinerator is in operation on a daily basis then the ashes and other waste material can be removed the following day as part of the preparation for operation. Dispose of the ash and other waste materials carefully by burying or placing in a skip for disposal by local authority or other authorised disposal company. The following notes are intended to give the operator a basic understanding of how to operate the incinerator. Optimum operation of this incinerator requires frequent attention to ensure that it performs effectively. It will take time for the operator to become familiar with the operation. Materials with high fuel values such as plastics, paper, card and dry textile will help maintain high incineration temperature. If possible a good mix of waste materials should be added with each batch. This can best be achieved by having the various types of waste material loaded into separate bags at source i.e. the wards and laboratories, and clearly labelled. It is not recommended that the operator sorts and then mixes the waste prior to incineration as this is potentially hazardous. The operator can then judge when to place which type of waste into the incinerator at any particular time. If possible some plastic materials should be added with each batch of waste as this burns at high temperatures. However, care and judgement will be needed as too much plastic will create dense dark smoke. Wet kitchen waste should not be placed in the incinerator. • The incinerator does not have a temperature gauge and so adequate operating temperatures have to be judged by the operator based on experience. A visual guide is to look through the air inlet and at the colour of the smoke from the stack. If a good strong flame can be seen then the temperature should be more than 800oC at this point and so will be adequate for good incineration. If the smoke is dark grey or black then poor combustion is occurring and the temperature will be below that required. Open the loading door and ash door and remove any ash or other materials from the fire box, ensuring that the grate is clean and the entrance to the flue is not blocked. Before lighting the incinerator, prepare the fire wood, ensuring that it is dry and chopped or cut into short lengths (that fit horizontally through the loading door) and not more than 75 mm (3”) in section. If the wood has a high moisture content (i.e. above 15%) then it will be difficult to get the incinerator up to the operating temperature. Place paper on the grate and cover with dry kindling and small pieces of wood and/or dry textiles. Light the paper through the ash door and NOT through the loading door. (This prevents the operator being burnt if paper and kindling material flare up unexpectedly). Once the fire is established and burning well, start adding the fire wood in small amounts. The loading door can be closed after about 5 minutes from lighting and once the fire is being drawn from the primary combustion chamber into the secondary chamber and up the stack. roar and will be audible through the air inlet tubes. Practice will enable the operator to judge when the fire is established. Once up to operating temperature, start to add the general waste material on small batches at regular intervals. The level of material in the incinerator should be such that the incinerator is always above half full. If the waste is predominately unwanted drugs, straw or wood may be placed in the incinerator before the drugs to hold the boxes in position for a longer period in order to prevent pills falling through the incinerator without burning. Sharps, including hypodermics, should be mixed with other waste to prevent them falling through the incinerator without being destroyed. If the waste material has a high moisture content or has a low fuel value, wood can be added to help maintain the correct operating temperature. The grate and flue entry should be checked every 15 minutes and raked clear of any obstruction. This is to ensure that the airways are kept clear. At the end of the operating session and all the waste has been placed in the incinerator, add more wood to ensure that any waste residue has been completely burned. Once the fire is established and burning well, start adding more card, paper and/or dry waste and kerosene until the incinerator is up to the operating temperature. This will probably take about 1/2 an hour. The ash door can be closed once the fire is well established. A well established fire will roar and will be audible through the air inlet tubes. Practice will enable the operator to judge when the fire is established. Once up to operating temperature, start to add the general waste material in small batches at regular intervals. The level of material in the incinerator should be such that the incinerator is always above half full. If the waste is predominately unwanted drugs, straw may be placed in the incinerator before the drugs to hold the boxes in position for a longer period in order to prevent pills falling through the incinerator without burning. If the waste material has a high moisture content or has a low fuel value, kerosene can be added to help maintain the correct operating temperature. At the end of the operating session and all the waste has been placed in the incinerator, add more paper, card and kerosene to ensure that any waste residue has been completely burned. it is not necessary for the steel section to be exactly the size as stated for example angle iron 50 x 50 x 3mm would be an alternative for 40 x 40 x 3mm. This page was last edited on 24 June 2010, at 20:31.